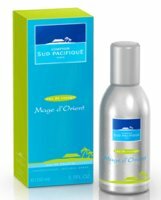 Comptoir Sud Pacifique has launched two new fragrances: Mage d'Orient and Eau de Naphé. Mage d'Orient (shown) is a woody fragrance with exotic fruit accents and a floral heart. The notes include bergamot, citron vert, fresh coconut, marine accord, jasmine, orange blossom, sandalwood, cedar, tonka bean, amber and vanilla. Eau de Naphé is a floral scent with orange blossom and a "sumptuous bouquet of white flowers". The notes feature elemi, orange, bergamot, jasmine, orange blossom, ylang ylang, white musk and cedar. Avon, huh? Ooh, strike one. Okay, I don't want to start things off on a catty note, but a brand new fragrance that goes for $22 per 45 mL? I'm sure the younger demographic will appreciate Jewel by Mark if not the niche fragrance cult. Actually, I want to have a generous attitude toward Avon products because they're all cruelty-free and I'm a vegetarian. Sometimes my daughter will drag me to a gift shop that carries tons of Avon stuff because she likes their lotions. I've tried to give Avon a chance and I really don't mean to insult people who like that company. It's just that I find their fragrances smelling so cheap and often downright offensive that now I'm biased. In a similar fashion, I love all the work that Kenneth Cole has done to spread AIDS awareness but that doesn't mean I can cope with his first fragrance. I'll stick to his fabulous luggage. Don't worry about coming off catty, because I feel the same about every Avon fragrance that has ever come out. I've never found a perfume in that line I've liked, and being that my father's white trash aunt sells this crap, and I get it pushed in my face almost daily! I can't even begin to tell you how many times I've had to run to the bathroom and wash my hands and neck just to get the scent off of me! Yikes! This purfume was previously sold by Bath & Bodyworks under the name “Hopes & Dreams” (from American Girl). They recently said they were discontinuing it because the price point was too high for the kids ($20) bucks a pop as well. It is actually my absolute favorite, so I bought the new Mark Jewel to make sure & yep it's exactly the same, just repackaged & now available through Avon. Hopefully, everyone stops paying $30 a bottle to get their hands on the old “Hopes & Dreams” at Ebay and goes directly to Avon to get it now. Although, if you contact them no will ever admit these are the same, but check for yourself, I promise you – it's newly packaged aimed at teens + instead of being in the kids line at B&B. People actually stop me everywhere I go to ask me what I'm wearing and tell me how good it smells. I will never wear anything else! Plus technically Jewel isn't really Avon anyways it's by the Mark makeup line (Lauren Conrad from MTV the hills new line). It is younger, hipper, fun & flirty – not your Mom's old Avon or the kind grandma use to use as a cheap stocking stuffer. I'm not to big on Avon either, but the “Mark” line is more like “Benefit” – it's just what they needed to freshen things up. I highly recommend it! Late reply — but can't say much anyway since I never get to smell anything from Avon! Thanks for heads up — I probably won't get to smell it but glad to hear it's nice!